Operating from U.S. Navy airships during the early 1930s, diminutive Curtiss F9C-2 Sparrowhawks tested one of the more imaginative ideas in aviation history. Deployed with the USS Akron and Macon, they turned these airships into flying aircraft carriers. The airplanes, which could be released and recovered in flight, were to be used for attack, for defense of the airships, and to greatly increase search range for the Navy's giant, helium-filled dirigibles. Eight Sparrowhawks were produced for this purpose. The first arrived at Lakehurst Naval Air Station, New Jersey, in June 1932, and experimental trials with airship-based fighter support were brief. The Akron was lost in a storm on April 4, 1933; the Macon crashed off the California coast on February 12, 1935. Before these accidents, not a single Sparrowhawk was lost. However, with only three remaining, and no dirigible from which to operate, the aircraft were relegated to utility flying. American military policy was defensive in orientation between the world wars. Two new airships, the U.S.S. Akron and Macon, were intended to be airborne coastal defense scouts, keeping watch over the approaches to the United States. These airships had greater visual search capability than the surface fleet. Adapting the recently developed concept of the aircraft carrier, airplanes mounted directly to the airships could be used for attack, for defense of the airships, and to greatly increase the search range. 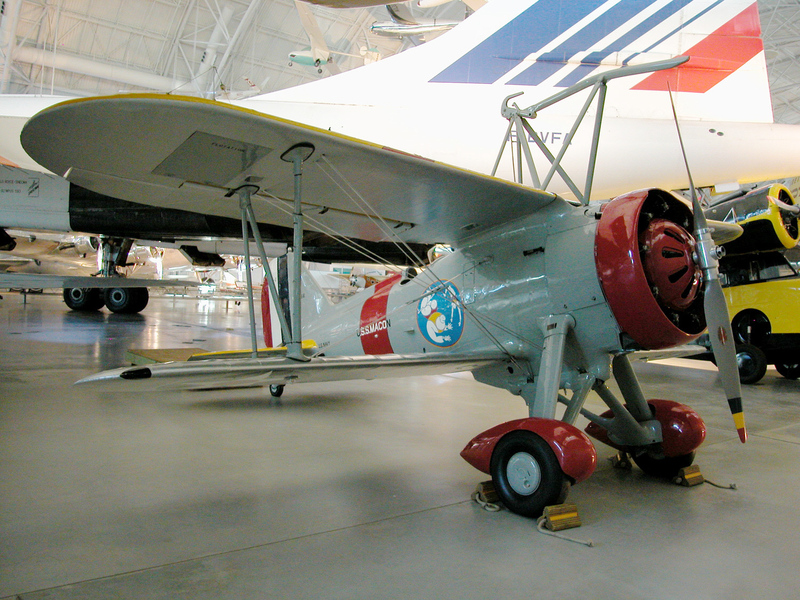 The Curtiss Sparrowhawks were assigned to the lighter-than-air (LTA) unit of the Navy. Originally designed for surface carrier operations, the Curtiss Sparrowhawks initially failed to win Navy acceptance. When the need for an airship-based fighter was raised, however, the small size and light weight of this airplane made it a suitable candidate. Eight Sparrowhawks were produced for this purpose at the Buffalo plant of the Curtiss Aeroplane Company. The first production model of the F9C-2 arrived at Lakehurst Naval Air Station, New Jersey, in June 1932. This was the home base for the Akron when on sea patrol duty along the East Coast. Air tactics for airship-based missions were developed during these patrol flights. After the airship launched the Sparrowhawks from its internal hangar, the fighters would simulate attacks against the airships while gunners on board would "fire" back with gun cameras. As airborne scouts, two Sparrowhawks would fly abreast of the dirigible, reporting various sightings by radio. When the scouting mission was concluded, the airships accelerated to full speed, which was slightly above the Sparrowhawk's stalling speed. This provided a sufficient margin of maneuvering speed for the Sparrowhawks as they approached for the recovery operation. The pilot skillfully guided the overhead hook on the airplane to the horizontal bar of the extended recovery trapeze. Once the fighter had hooked on, its engine was stopped and the trapeze was raised into the open belly of the dirigible, and the airplane was stored in special racks. As many as four could be recovered in successive hook-ons. The Sparrowhawks were launched by reversing this procedure. The Navy's experimental trials with airship-based fighter support were brief. The Akron was lost in a storm on April 4, 1933, killing 73 personnel, including Admiral William A. Moffett, Chief of the U.S. Navy's Bureau of Aeronautics. The Macon crashed off the California coast on February 12, 1935, fortunately with the loss of only two crew members. Before these accidents, not a single Sparrowhawk was lost. Now, however, with only three remaining, and no dirigible from which to operate, the aircraft were relegated to utility flying. In this capacity, they were not well liked by the pilots who flew them. By 1939 the last aging Sparrowhawk was retired and transferred by the Navy to the Smithsonian Institution. In its final years the aircraft had been rebuilt from the best parts of the surviving F9C-2s and carried the bureau number 9056. For exhibit purposes, it was marked with the unit colors of the U.S.S. Akron and attracted the interest of many museum visitors. In 2006, an expedition led by the Monterey Bay Aquarium Research Institute and the National Oceanic and Atmospheric Administration investigated the Macon crash site and recorded four Sparrowhawk aircraft. Recognizing the significance of this little fighter in later years, the Potomac Chapter of the Antique Airplane Association, under the supervision of National Air and Space Museum, restored the airplane as a group project. In 1974, the fighter emerged like new in the elaborate colors of the U.S.S. Macon unit to which 9056 had been assigned. The insignia of the "Men on the Flying Trapeze" on the fuselage sides symbolizes those exciting days of the great airships and the spectacular aircraft launch and recovery method that was tested. The dirigibles are gone, but this one remaining Sparrowhawk is tangible evidence of the almost forgotten days of military LTA experimentation.